efforts of our people to push boundaries and continually enhance all aspects of our customer experience,” Air New Zealand chief executive officer Christopher Luxon said in a statement. “Customer focus underpins reputation leadership. We maintain our leading position by continuing to invest in our aircraft, products and services and by bringing genuine Kiwi warmth to the 17 million journeys we’re part of every year.” Recently, travellers named Qantas Australia’s best airline but Air New Zealand the best in the South Pacific region in TripAdvisor’s Traveller’s Choice Awards. Air New Zealand received a slew of awards in the South Pacific and Oceania category, including best economy, best premium economy and best business class. It was also named as having the best premium economy class in the world. Air New Zealand climbs to top on trust THE AUSTRALIAN, APRIL 17, 2019 The public’s trust remains strongly weighted towards airlines, with Air New Zealand’s chief executive Christopher Luxon conceding that he spends much of his day concentrating on building the carrier’s reputation. The long-term Air New Zealand chief said he spent 35-40 per cent of his time dealing with reputational cultural matters for the airline, which operates about 17 million flights annually and employs 12,500 staff. “The best companies in the world really deliver for their customers,” Mr Luxon told The Australian yesterday. “We measure accomplishment through the three lenses of commercial success, customer and culture … we see them as equal if you want to be a great world class company.” Reputation was really important for people-oriented businesses such as airlines, he added. “If you don’t have an outstanding reputation, how do you build a successful business? Reputation is everything.” Mr Luxon said he spent a lot of time across Australia and in New Zealand meeting with other organisations discussing Air New Zealand’s experiences and strong brand reputation. “(But) we don’t have it all right all the time. We keep wanting to get better and we learn from (other companies) as well,” he said. “There are 195 countries in the world and Australia and New Zealand have the two most investable airlines in Air New Zealand and Qantas. 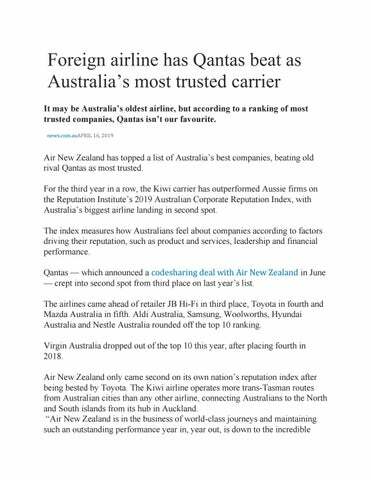 “There are 170 airlines and we are consistently ranked in the top.” Air New Zealand controls about 6-7 per cent of Australia’s international market, while Qantas controls about 20 per cent of the international market. Qantas chief customer officer Vanessa Hudson said as the national carrier, “we’ve worked hard to build a reputation through the services we deliver but also by championing the spirit of Australia”. “It’s the combination of what you do and how you do it. The trust people have in the Qantas brand is something we never take for granted,” Ms Hudson said. Air New Zealand was ranked No 1 while Qantas ranked second on the Australia 2019 RepTrak research, which looks at which global companies are the top-ranked reputation leaders. Surprisingly, property developers, including Stockland and Lendlease, did not fare too badly on the Australia 2019 RepTrak of the top 60 local companies. Mining companies, telcos and banks did not achieve strong results. In fact, AMP ranked last on the survey, coming in at No 60.